Continuing its quest for the crown of Eyesore Purveyor of the Year, CBS Outdoor presents this beauty on Venice Blvd. Or is it a witty statement about the Angels’ flop in the recent American league playoffs? In any event, the company reported a $35 million loss for the 3rd quarter of this year, so expecting it to comply with a sign code requirement that billboards without advertisements be covered with a clean, blank surface is clearly unreasonable. 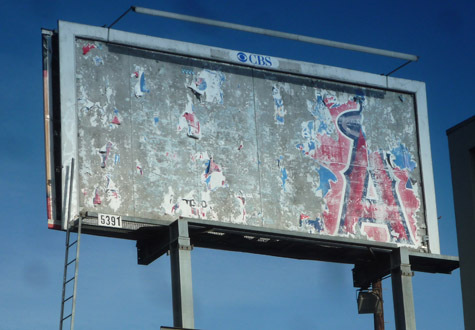 I’ve heard that in some places, if a billboard isn’t advertising anything for a certain period of time, it is considered abandoned and has to be removed. Why can’t L.A. do that? I’ve seen billboards like the one in the photo that have been that way for at least a year, if not longer.